European policymakers increasingly are looking at the Fezzan, Libya's vast and scarcely populated south west, as their frontier against sub-Saharan African migrants and refugees traveling the Central Mediterranean route to Europe. In 2016, over 160,000 took this route from Libya on makeshift boats; most had entered through this region, which connects the country's southern border with its coast. Several European countries, chiefly Italy, hope that stabilising the situation in the Fezzan and reviving its economy will help curb migrant flows. The idea has merit, but this will be no easy task and cannot succeed without also addressing the broader crises gripping the country. Any European effort to address governance, economic and security problems in the Fezzan should be coordinated with the internationally recognised government and linked to wider, nationwide initiatives to tackle issues that plague the country as a whole. 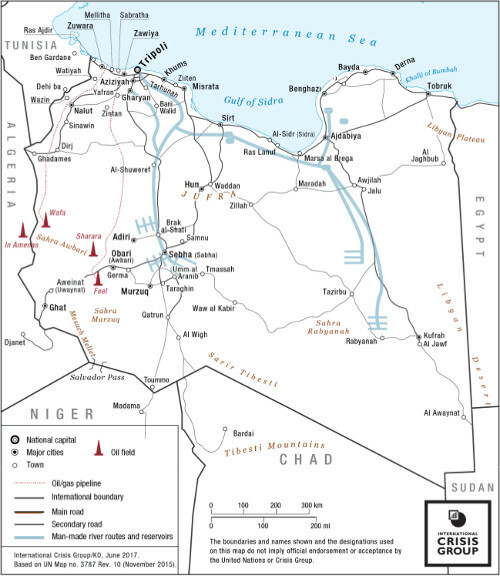 "The Fezzan sits at a regional crossroads, linking southern Libya to the Sahel and sub-Saharan migrant routes to northern Libya and onto Europe." The Fezzan suffers from multiple problems, most of which are not of its own making. The region's licit economy is depressed, but the national economic and financial institutions that could help revive it are largely paralysed. By contrast, the illicit economy is booming. The Fezzan sits at a regional crossroads, linking southern Libya to the Sahel and sub-Saharan migrant routes to northern Libya and onto Europe. While the region is richly endowed with natural resources, it suffers from the absence of a central authority able to impose order. Incentives for smuggling of all types - people, oil, gold, weapons, drugs - far outstrip those for making money through legal means. Ethnic and tribal tensions, magnified by the political vacuum and economic competition, have been exploited by rival factions competing to control the country. External forces - regional powers, foreign mercenaries and transnational jihadist groups - have also meddled, joining local conflicts or using the south as a transit zone. Stabilising the Fezzan in the midst of such a storm will be difficult, but it has been neglected far too long, to the detriment of its residents, its neighbours and Europe alike. The ongoing fight between Libya's rival military coalitions is perhaps the biggest challenge. The UN-backed Presidency Council and its Government of National Accord (GNA), headed by Prime Minister Faiez Serraj in Tripoli, has little standing and few local allies in the Fezzan. By contrast, factions aligned with General Khalifa Haftar's Libyan National Army (LNA) and the eastern government based in al-Bayda enjoy greater influence, as do factions that oppose both Haftar and Serraj. Deadly fighting between these various forces has increased since early 2017 and covert foreign military support to them seems likely to rise. The spread of these national rivalries into the south has been accelerated by tensions among tribes, which have fought five successive local wars since 2011. Despite ceasefires, the risk of further escalation remains high, in part because of the failure to deliver material compensation promised during past negotiations as well as delays implementing reconstruction plans. Stabilising the Fezzan is urgent, and not just to constrain migration. Without addressing the governance, economic and security issues in the south, Libya's broader political and military normalisation will be impossible. While this requires long-term investments, Libyan authorities and European governments can take immediate steps to smooth relations among southern tribes and improve living conditions - measures that, in due course, could reduce the incentive for people smuggling. For instance, foreign donors could work with Libya's recognised government to energise agricultural projects in the south that have fallen into disrepair. Oil companies operating in the Fezzan and Libya's National Oil Corporation (NOC) also have their share of responsibility; they should seek to increase local employment and invest more in local social development projects. Overall, Libya's neighbours, regional leaders further afield and international powers should make greater efforts to converge on a shared set of principles to address a Libyan peace process that is increasingly adrift, rather than narrowly prioritise their immediate interests. In the Fezzan as elsewhere in Libya, this would serve at least to avoid worsening an already bad situation and provide guidelines for restoring some semblance of a state - a goal that ultimately all should see as being in the country's, as well as the region's, best interests. Source :: crisisgroup.org, 31. Jul 2017.